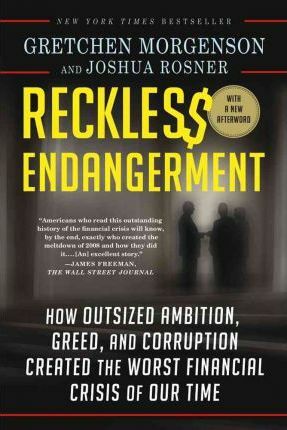 In "Reckless Endangerment", Gretchen Morgenson exposes how the watchdogs who were supposed to protect the country from financial harm were actually complicit in the actions that finally blew up the American economy. Drawing on previously untapped sources and building on original research from co-author Joshua Rosner - who himself raised early warnings with the public and investors, and kept detailed records - Morgenson connects the dots that led to this fiasco. Morgenson and Rosner draw back the curtain on Fannie Mae, the mortgage-finance giant that grew, with the support of the Clinton administration, through the 1990s, becoming a major opponent of government oversight even as it was benefiting from public subsidies. They expose the role played not only by Fannie Mae executives but also by enablers at Countrywide Financial, Goldman Sachs, the Federal Reserve, HUD, Congress, and the biggest players on Wall Street, to show how greed, aggression, and fear led countless officials to ignore warning signs of an imminent disaster. GRETCHEN MORGENSON is a business reporter and writes the Fair Game column at The New York Times, where she also serves as assistant business and financial editor. She was awarded the Pulitzer Prize in 2002 for her "trenchant and incisive" coverage of Wall Street. Prior to joining the Times in 1998, she worked as a broker at Dean Witter in the 1980s, and as a reporter at Forbes, Worth, and Money magazines. She lives with her husband and son in New York City. JOSHUA ROSNER is a partner at independent research consultancy Graham Fisher and Co. and advises global policy-makers and institutional investors on housing and mortgage-finance issues. He was among the first analysts to identify operational and accounting problems at the GSEs (government-sponsored enterprises) and one of the earliest to identify the peak in the housing market, the likelihood of contagion in the credit rating agencies' CDO assumptions. He lives with his son in New York City.